Sarnath, Varanasi, India – As the second day of the CIHTS’s Conference on Mind in Indian Philosophical Schools of Thought and Modern Science began, His Holiness the Dalai Lama arrived, greeted the presenters, moderators and respondents with him on the stage and waved to the audience before taking his seat. Moderator for the first session was Prof Jay Garfield, an old friend of the Institute, who is Professor of Philosophy, Logic and Buddhist studies at Smith College. He took the opportunity to mention that in addition to achievements already mentioned, the Institute has led the way in international exchanges of students and faculty. The 26 year old program has become a model for institutions like the Library of Tibetan Works & Archives and the Institute for Buddhist Dialectics to follow. He noted that the keys to success are leadership and co-operation. Garfield introduced Prof Asanga Tilakratne, Professor of Pali and Buddhist Studies at the University of Colombo, Sri Lanka. He spoke about the Theravada analysis of the mind—one of the most sophisticated analyses of the mind in any Indian philosophical system. Having rejected the existence of ‘atman’, Buddhism analyses the mind in terms of chitta, manu and vinnana. Chitta is something that is defiled or purified, developed or undeveloped, disciplined or undisciplined and is ultimately liberated. Vinnana usually indicates consciousness. It is one of the five psycho-physical aggregates and one among the twelve links of dependent arising. It also plays a role in rebirth as the factor that that connects a being from this existence to the next. Mano is mentioned mainly as a faculty like any other sensory faculty taking phenomena as its object. These three highlight different aspects of the same phenomenon. Invited to comment, His Holiness remarked that the term Theravada is a division of the Vinaya. He said he prefers to talk about the Pali tradition, which refers to the Buddhist traditions of Burma, Sri Lanka and so on, and the Sanskrit tradition, which by and large refers to the Indian tradition. He added that he prefers not to use the terms Hinayana and Mahayana because there is a tendency for those following the Mahayana to look down on those belonging to the Hinayana, and for the latter to question whether the Mahayana is actually the teaching of the Buddha. In the Sanskrit tradition there is talk of the three turnings of the wheel of dharma, among which the first represents the Pali tradition—including the Vinaya, shamatha, vipassana and the 37 factors of enlightenment—while the two other turnings refer to the Sanskrit tradition. He recalled that in the past some writers referred to Tibetan Buddhism as Lamaism as if it were not an authentic Buddhist tradition, but today it is universally acknowledged as the heir to the Nalanda Tradition. Next, Michel Bitbol, Directeur de Recherche at CNRS, Paris, who is presently based at the Archives Husserl, a centre of research in Phenomenology spoke. He drew attention to Austrian physicist Erwin Schrödinger, who was instrumental in the development of quantum physics and who took inspiration from Advaita Vedanta and Madhyamaka Buddhism. He suggested that for Schrödinger a belief in a duality of mind and matter, a belief that there are inherently existing objects with inherent properties is just naive. It results from our wrongly endowing with inherent existence those aspects of phenomena that we have isolated within our conscious experience. Schrödinger asserted this happens in order to provide them with some fake autonomy with respect to us, but there is no real distinction between objects and ourselves beyond this fabrication. He also stated that the unity of mind and consciousness does not need to be argued because it is directly experienced. Bitbol contended that Schrödinger’s deep assimilation of Indian thought enabled him to address the mind-body problem with no concession to either dualism or monistic materialism. His Holiness commented that the presentation made him think of the need for a deeper appreciation of the meaning of reality at odds with our naive view of the world. He alluded to Nagarjuna’s observation—‘Through the elimination of karma and mental afflictions there is liberation; Karma and mental afflictions come from conceptual thoughts and these come from mental exaggeration. Exaggeration ceases through emptiness.’ Karma and mental afflictions are rooted in ignorance and ignorance is the first of the twelve links of dependent arising. His Holiness repeated his speculation about whether quantum physicists’ insights have any influence on their disturbing emotions. Bitbol told him that Buddhism helps him better understand the world and overcome his sense of unease. The morning’s third presenter, Dr Thupten Jinpa, trained as a monk at Shartse College of Ganden Monastic University where he earned a Geshe Lharam degree. He went on to earn a PhD at Cambridge University and is now adjunct professor at the School of Religious Studies at McGill University. His focus was three core features of consciousness in Buddhist philosophy of the mind—intentionality, the object directed aspect of consciousness; reflexivity, the self-revealing nature of consciousness and subjectivity which refers to the experiential dimension of mental events or their first person character. Jinpa explained that the subjective dimension of consciousness is today an important focus for contemporary Western philosophical and scientific discourse on consciousness. A key feature of mental events is the way in which they are experienced by the subject, whether it is a simple sensation of pain or seeing the colour blue, referred to by some philosophers as ‘what it feels like’. The two other features, intentionality, the idea that consciousness is about something, that there is content to it, and reflexivity, the basic level of self-reflective awareness, have received greater attention in contemporary phenomenological enquiry. Jinpa quoted Shantarakshita on this: ‘The nature of consciousness is reflexive awareness, and that which is not reflexively aware is insentient’. Dignaga, Dharmakirti and Shantarakshita were proponents of ‘strong reflexivity’, asserting that reflexivity is the fundamental character of consciousness, not intentionality. However, Madhyamaka philosopher, Chandrakirti, explicitly refutes such a ‘strong reflexivity’ thesis. Jinpa concluded that to take these three as defining features of consciousness would raise formidable challenges to scientific projects to explain it. His Holiness laughed and said that from a Madhyamaka point of view it seemed that Jinpa’s assertions were both nihilistic and absolutist. However, he also observed that exposure to other ideas broadens our intelligence and that analysis is enriching. After a short break for tea, the morning’s second moderator, Renuka Singh, a sociologist from Jawarhalal Nehru University, called on the audience to reassemble. She introduced the final presenter, Ceon Ramon, now retired but whose research has involved neuroscience, cortical neurodynamics and brain / mind interactions. He reviewed the nature of the mind from neuroscience and physics perspectives. Although neuroscience can map and measure emotional states of the brain such as love, anger, sadness, compassion etc with EEG and fMRI, it still has difficulty defining the nature of the mind, that is to say human consciousness. There is a need for a comprehensive theory to explain it. Physicists have proposed theories of consciousness based on quantum theory, which can help to understand how interaction with the external world changes our internal thought processes. Equally, changes in our mental states might also influence our view of the external world. The prevailing view among neuroscientists is that mind arises from the brain and when the brain dies, so does the mind. However, a few neuroscientists are now beginning to question this idea. Some say that mind or consciousness may be separate from the brain and that part of the mind may be intertwined with the brain, but still a separate entity. Ramon looked forward to creating an interdisciplinary approach with better tools to probe the nature of the mind. Invited to respond, His Holiness recalled visiting the USSR in 1979. In conversation with scientists he mentioned the sixth, mental, consciousness as distinct from sensory consciousness. They dismissed this as a matter for religion. Since then, sensory consciousness has been mapped in a way that mental consciousness has not. His Holiness reported the observation of his friend, Wolf Singer, that there is no central authority in the brain. His Holiness added to the reports he made yesterday about realized meditation practitioners whose bodies remain fresh for some time after clinical death. A Lama who died in New Zealand was in this state and on the fourth day, his hands moved. His left took hold of the ring finger of his right hand. Neither scientists nor Buddhists have an explanation for this. 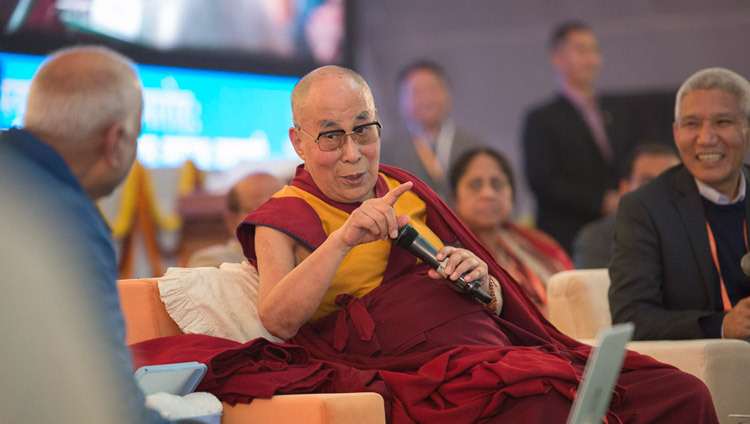 His Holiness also mentioned the case of an accomplished meditator in Tibet who was arrested during the cultural revolution and was being taken to a ‘struggle session’. He asked to sit and rest for a while. He engaged in the practice of transference of consciousness and was gone. Ramon took up the question of monitoring of those who remain in meditative absorption after clinical death, suggesting that there are techniques for remotely measuring changes in bodily heat that would make the attaching of electrodes to the body unnecessary. In his final remarks His Holiness reiterated his sense that there is much to be learned from ancient Indian thought that can be relevant today in terms of learning to tackle destructive emotions. He contends that India is the only country that could combine the benefits of modern education with ancient Indian knowledge enabling more people to achieve peace of mind. He noted that in the Tibetan monasteries in South India are hundreds of monks, who after 20 years rigorous study are well-qualified to teach about this. In his words of thanks, CIHTS Vice-Chancellor Geshe Ngawang Samten expressed gratitude to His Holiness for attending the conference. He also paid tribute to what His Holiness has achieved in bringing about changes in education and the way people approach the notions of peace and happiness through training the mind. In addition, His Holiness’s efforts to foster religious harmony and appreciation of human values have had far-reaching effects. On behalf of all present he expressed heartfelt gratitude.